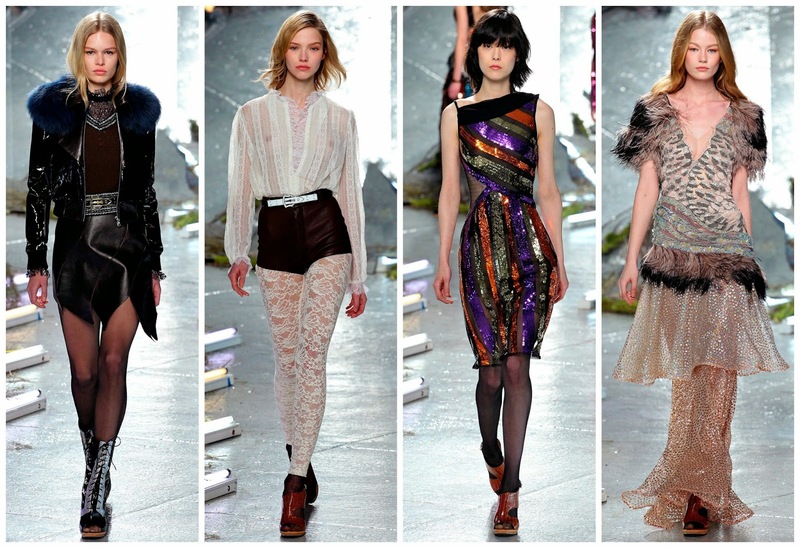 Rodarte sisters Laura and Kate Mulleavy presented my favourite collection at New York Fashion Week so far. The Californian duo are always on my watch list as I look forward to seeing what creations they produce each season. For Fall 2015 there was a mixture of 70’s rock chick, with a dash of equestrianism and disco funk. My favourite model, Anna Ewers, stormed the runway in the opening look. Yet again my top trend of the season was present. Anna’s black cropped jacket was decorated with an electric blue fur collar. A diagonal leather mini skirt was also worn in the look. High waisted skinny leg leather trousers followed in suit. A similar jacket, this time with a fox-coloured fur collar and a black sheer lace blouse was worn. The equestrian vibes continued with a chequered fur collared coat that wouldn’t look out of place in a stables. A fashionable stables of course. Laced up, heeled riding boots completed the looks. The gothic looks continued and then there was a burst of colour. A Swarovski embellished spaghetti strapped cami was tucked into a flower petal mini skirt. Look 19 began a slew of white looks. A white blouse with billowing sleeves was paired with black high waisted hot pants and lace leggings. Look 21 was a similar dress worn with thigh high leather boots. It was a goths take on being girly. I loved it. The girl then became a funky disco warrior come Look 28. The bright yet autumnal sparkling dress were originally just above the knee, a seductive yet respectable hemline. As it progressed they became more symmetric, exposing more skin. The trio of finale gowns are everything we expect and more from the Rodarte duo. A plumage enhanced shoulder piece on a plunging neckline gown with a tiered shimmering skirt was worn by Hollie May Saker. Grace Mahary wore the penultimate look, a floral embroidered and printed gown enriched with orange and black fur strips and a blue shimmering skirt. The finale look was a long sleeve open neckline, with a deep plunge, and sheer details. Electric blue and black ombre fur lined the look at different parts and three different parts compartmentalised the dress into three. I can always count on Laura and Kate to bring undivided glamour, with a touch of unique Rodarte quirkiness and a lot of creativity. Every season for the past number of seasons they are bringing something new to the plate while staying true to themselves and the Rodarte woman. What a splendid collection.